There’s been a lot of information released about the contents of the new space marine tactical squad. Using this information I’m going to make some highly optimistic predictions about pretty much everything that will appear in the kit. Currently there are 3 sprues in the box. Two identical sprues providing 5 marines each and an addition one the Sargent and special weapons marine weapons and a Missile Luncher. I had expected this to change. 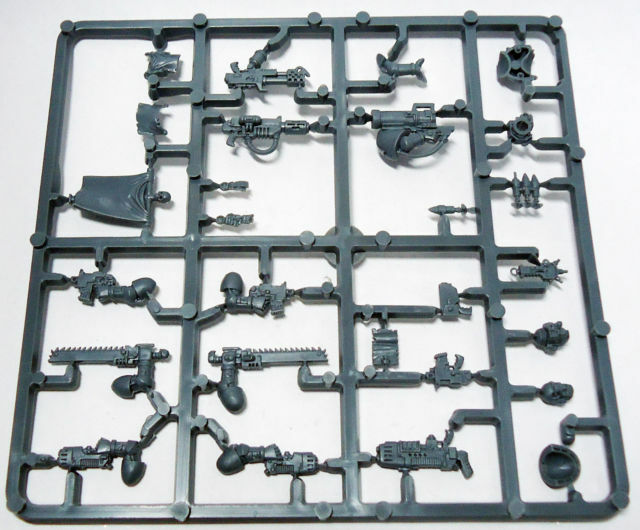 The Space Wolf pack only has two identical sprue’s and I thought they might have done the same with the tactical box, meaning you would have got at least 2 of everything. However in the last couple of days it’s been confirmed there will be 3 sprues in the box with all weapon options, apart from the Seargent’s combi weapon. That’s a huge number of weapons. It’s hard to imagine how they can fit all this in using the current format of two identical sprues for the 10 marines and one for the options. It goes without saying we should be expecting 10 space marines. 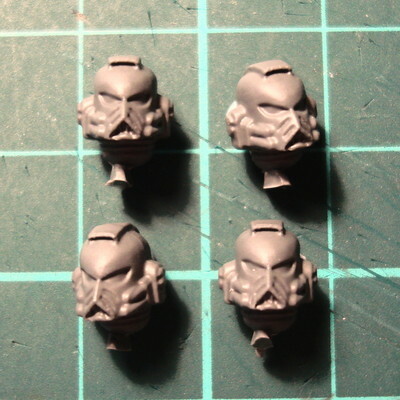 Currently you are given one extra shoulder pad, 4 extra heads and an extra torso front. You also get two, chainswords and plasma pitols and tons of bolt pistols. In fact you can build a 5 man assault squad if you really want. To do this you need to give the Sargent a plasma pistol and scanner, one man plasma pistol and chain sword, one man bolt pistol and chainsword and one man 2 bolt pistols. Of course you just need another 5 assault marines to make it legal. This is something I think they might change. If there are all weapon options present, it would mean a Missile luncher, Heavy Bolter, Plasma Gun, Las Cannon, Multi Melta, Flamer, Plasma gun, flamer, plasma pistol, power glove, power sword and or axe. This would be no bad thing as instead of being able to use the box in combination with the assault box set to make a 10 man Assault Squad without jump packs, not the most useful combo. You would now be able to make a devastator squad with a range of weapons buying two sets would enable you to make 2 Devastator squads with different battle field roles, eg. one with missile luncher/Melta and Las Cannon to go anti tank and one with Heavy bolter and Heavy Plasma/Missle Luncher for anti troop. Combining one of these boxs with two of the current Devastator squad sets would give you 3 of every heavy weapon and 5 Heavy Bolter, Plasma Cannons and Lascannons, more choice than you could possible want. I imagine you’d end up just like me with some Heavy Plasma and Heavy Bolters at the bottom of your bits box. Of course all we have is rumours and I’m really surprised they are covering all the heavy weapons in the set. I was expecting them to just do just the free options for the squad, Missile Luncher and Heavy Bolter. If you look at the drawing of the Second Company in Codex Space Marines you get a hint at what the the Design Studio thinks a Space Marine company should look like. In any squad there are more suits of Mk7 than anything else, there are one or two Mk6 and then a scattering of Mk8, Mk5 and Mk4. There are very few Mk2 and 3 suits. 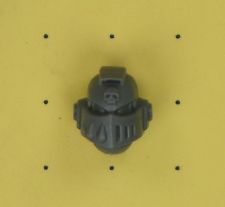 Games Workshop have always tended to over use Mk7 armour in the squads. This is probably because they know we like it and will buy it. Remember they did Mk6 sets once and these were retied as they were out sold hand over fist by Mk7 sets. There are currently 11 torsos and 10 sets of legs in the tactical box set but only 6 cheat plate designs and 3 leg designs. There are two ways GW could increase this. One is by moving the Sargent chest plate and adding a couple more designs onto the marine sprue. One set of rumours suggests there are going to be more Mk8 armour suits if there is a duplicate of the Sargent Mk8 torso this would all make sense. The other way GW could achieve this is by getting rid of the duplicate sprue and making all the models unique. While this would increase the deigns costs it frees up any space duplicate parts would take up. If they are covering all the weapons in the squads options they will need all the space they can get. 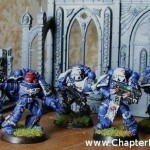 The other thing about the tactical squad is that it’s GW most popular box set, across everything they sell. It not hard to understand why when you consider you need 7 for a space marine company and it can be used in every Space Marine army. If they can justify making 3 unique sprues this is the one box set that it would be possible for. There are also preditions of “goodies” from the Blood Angles, Space Wolves and Dark Angels box sets. Of course there won’t be blood drops or wolf pelts so this must refer to the. 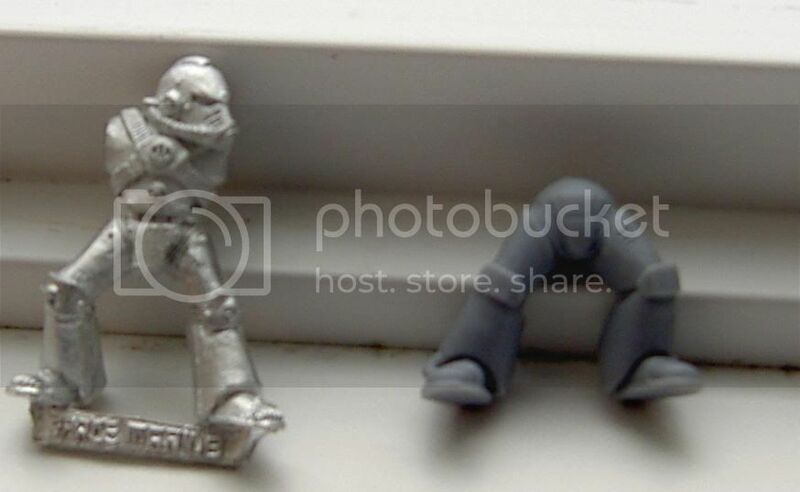 Mk 5 style armour helmet in the Space wold set (top left below). The blood angels box gave us a Mk 3 and Mk 4 helmet. 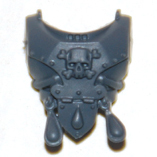 The Mk4 also appeared in the black templars kits. Providing plenty of choice and meaning you don’t have to have lots of old armour style heads if you don’t want to. I spoke to one of the designers involved in this new box set at Games Day. He said nothing too definate to me about what would be in the kit but did say they couldn’t make real Mk 8 legs. I’ve included a picture of some Mk8 legs below. 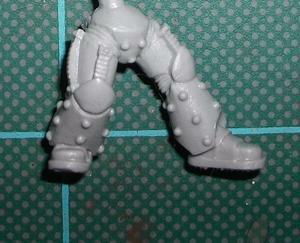 The only real difference to Mk7 armour is the little round bits inside the lower leg plate’s ankle joint. This also appears on some Mk3 armour. It’s hard see it on this photo but it’s just about visible on the LOD with a completely black helmet. We already have Mk8, Mk7 and Mk5 chest plates in the tactical box set. 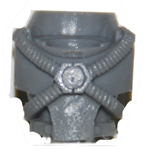 There is a MK6 chest plate on the old space wolf sprue (shown below). It’s surprising they haven’t used this in a another kit since the old Space Wolves box set. I think/hope we will see this return in the new box set along with a Mk4 style chest plate, which was present in the Blood Angels box set, shown below (right) next to Forge Worlds design (left). We may see some sort of nod to the Mk3 torso like on the Chronos model, but there might be a full redesign like forge world have done. 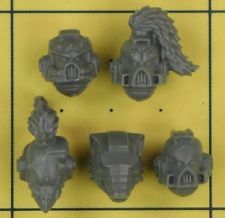 This gives less choice than heads but as cheast plates need more sprue space I expect we will get less. Assuming there are 3 unique sprues I expect legs will follow much the same patten. Four different Mk7 sets to be used with Mk8 torso as well, Two different Mk6 posses, Mk5 is going to be a bit tricky to do in plastic. If we do get one it won’t been identical to the Forge World or armour through the ages legs. The studds would need to be moved to allow the mould to release, but it’s not impossible for them to do something. It should be easy for them to do a set of Mk4 legs. They are easy to make from the current Mk6 set. You can even just paint a line across the knee (like I have below). Sorry I can’t see that they will be able to manage to mould Mk3 legs in plastic. I do think they will do Mk2 though. It doesn’t have as much detail in the places that are difficult to mould. This gives you no choice but legs are the lest noticeable part of a model. GW have never put more legs than needed in a kit, with the exception of the devastator set. Over lapping plates was only used on Mk1 armour and I don’t expect we will see any of that. I expect there will be enough rimmed shoulder pads to do a full squad, then just a hand full of other styles. 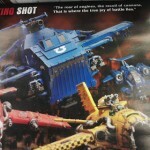 It’s my hope that they may include a few retro bolter designs. If they do I expect they will stay away from what Forge World have done and try to cover the designs shown in codex Space Marines. However this would be the first time they would be using old bolters in a new kit so I wouldn’t expect to see a lot of them. Below are some Mk2 and Mk3 bolters. I think we are on Mk4 and Mk5 these days. Well there has been a lot of noise about this kit, but no release information. 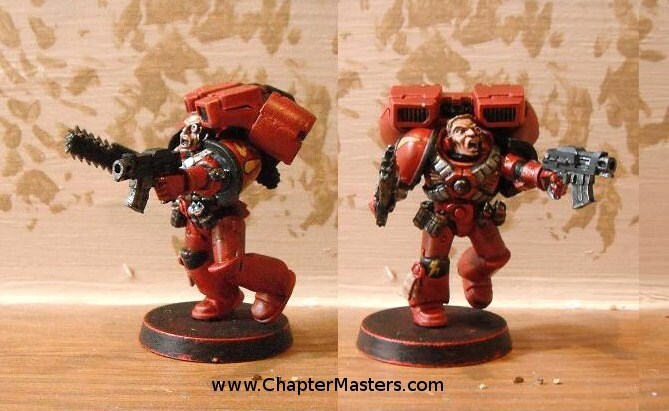 The last plastic Codex Space Marine power armour squad to be released was the Devastator Squad, it came out along side Dark Angels back in 4th edition. 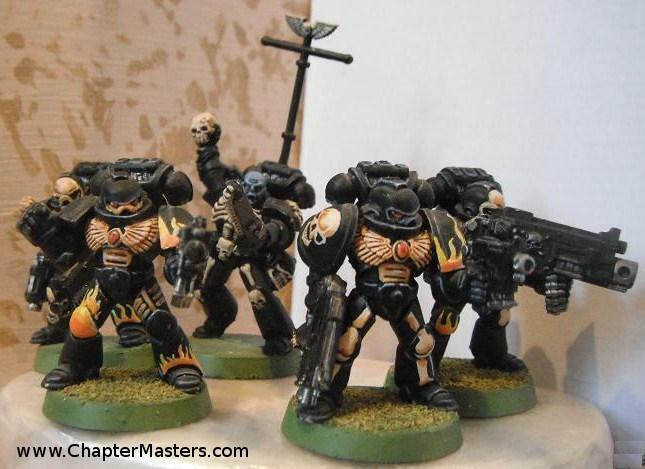 So it’s not hard to imagine this kit will follow that trend coming out with the next Codex. The next codex is meant to be Dark Angles and it’s due out sometime in the next 6 months or so. April being the last date mentioned although it’s also been rumoured to be November, December, January and February! I take that to mean they just don’t know. 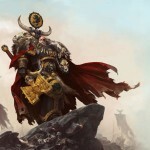 New Sternguard to replace the old Space Marines? This entry was posted in Articles, Rumours, Space Marines. Bookmark the permalink. ← Today’s Question: If a model is charging a unit behind a wall, how may dice does it role for it’s charge range? Some of this was right, but some of it was miles off!